The sleepy tropical island lies dark and tranquil beneath the majestic coconut palms that stand side by side like tall, watchful sentries, silhouetted against a pale early morning sky that is beautifully smeared with orange, gold and mauve. Lines of our fresh footprints lie embedded in the sand, down the gentle slope of the beach and into the water where a small fish breaks the surface with a tiny plop, the ripples spreading outwards and away until they gradually dissipate and are slowly swallowed up by the oily smooth surface. A black-headed heron stands motionless in the shallows, its graceful, curved neck poised in the classic stalking position as it patiently waits for some unwary pre to venture too close. The only activity in the stillness of the new dawn is our movement on board the dark shape of the big catamaran lying just off the beach as we prepare for a day out at sea. Beyond us stretches the mirror-like expanse of the protected lagoon, the painted sky an inverted reflection on its smooth, glassy surface. It's going to be a beautiful, perfect day. "Good to go!" comes the shout from up front as the heavy ropes are tossed off, splashing loudly into the dark, warm water below. The skipper gently eases the big boat off her moorings, swinging her bows around until they are pointed into the south and towards the distant channel marker buoy. The rhythmic throbbing of the big diesel inboards increases steadily in tempo, breaking the early morning silence as sleek motor yacht gracefully lifts her nose and powers her way determinedly towards the outer lagoon entrance where the deep waters of the Indian ocean await us. On board there is a flurry of activity as bags are opened, buckets are filled, rods stashed, hand lines unravelled and the deck space cleared. 14-weight fly rods and hi-visibility fast sinking lines are prepared for battle and tactics for the day are discussed amongst the anglers and skipper. Ten minutes later everyone is ready and the first fingers of sunlight are just beginning to reach outwards from the horizon as the boat enters the channel and heads over the steep drop-off into deep water. 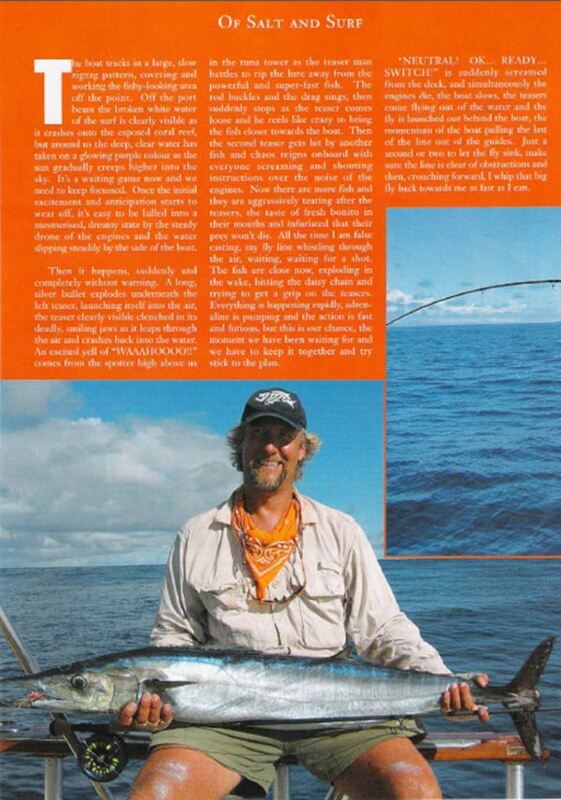 Almost immediately the engines slow and the small bonito lures are quickly lobbed overboard into the wake. There is a fair bit of swell outside the confines of the reef, and the boat heaves and rolls slowly as we troll along the drop-off looking for fresh bait for the teasing rods. Up ahead of us a handful of terns dip tentatively towards the surface as they hover above a patch of baitfish activity in the water. It is a small shoal of bonito and it's not long before the thin rope hand lines snap taught and three of these shiny, flapping fish are hauled on board. Immediately one of the guys gets to work on the bonito, cutting fresh belly shines from all three fish and stitching them onto plastic skirts to be used as hookless teasers. The skipper swings the boat into a tight turn, the lines are tossed back into the water and we retrace our path looking for another strike. Half an hour later the bait buckets are filled sufficiently for the days fishing and we turn and head towards the north-eastern point of the island where the tidal currents meet in an up welling of nutrient rich waters. As the final tackle preparations are made, someone scales the long ladder up to the high tuna tower to act as a spotter and far below him the rest of the crew clears the deck for action. We soon reach the fishing grounds and the boat almost immediately slows to trolling speed. Reel clutches are disengaged as the baited, hookless teasers are fed out behind the boat and they are soon skipping enticingly in the wake. Next the long and colourful daisy chain is fed out off the stern, splashing and surfing in the broken white water close behind the boat. I am up first on the fly rod and take up position in the starboard corner of the wide stern, loose line stripped into a bucket of seawater and rod at the ready. A big purple and white tandem sailfish deceiver pattern is pinched between thumb and forefinger, and a loop of fly line swings slowly from the tip of the rod, clipping the water every now and again as the boat rolls in the choppy current line. Its all stations go now and all eyes are on the teasers, everyone willing the first game fish of the morning to explode behind them. The boat tracks in a big slow zigzag pattern, covering and working the fishy looking area off the point. Off the port beam of the boat the broken white water of the surf is clearly visible as it crashes onto the exposed coral reef, but around us the deep, clear water has taken on a glowing purple colour as the sun gradually creeps higher into the sky. It's a waiting game now, and we need to keep focussed. Once the initial excitement and anticipation starts to wear off it's easy to be lulled into a mesmerized, dreamy state by the steady drone of the engines and the water slipping steadily by the side of the boat. Then it happens, suddenly and completely without warning. A long sliver bullet explodes underneath the left teaser, launching itself into the air, the teaser clearly visible, clenched in its deadly, smiling jaws as it leaps through the air and crashes back into the water. An excited yell of "WAAAHOOOO!!" comes from the spotter high above us in the tuna tower as the teaser man battles to rip the lure away from the powerful and super fast fish. The rod buckles and the drag sings then suddenly stops as the teaser comes loose, and he reels like crazy to bring the fish closer towards the boat. Then the second teaser gets hit by another fish and chaos reigns on board with everyone screaming and shouting instructions over the noise of the engines and wake. Now there are more fish and they are aggressively tearing after the teasers, the taste of fresh bonito in their mouths and infuriated that their prey won't die. All the time I am false casting, my fly line whistling through the air, waiting, waiting for a shot. The fish are close now, exploding in the wake, hitting the daisy chain and trying to get a grip on the teasers. Everything is happening so fast, adrenaline is pumping and the action is fast and furious, but this is our chance, the moment we have been waiting for and we have to keep it together and try stick to the plan. "NEUTRAL! OK ... READY ... SWITCH!" is suddenly screamed from the deck, and simultaneously the engines die, the boat slows, the teasers come flying out of the water and the fly is launched out behind the boat, the momentum of the boat pulling the last of the line out of the guides. Just a second of two to let the fly sink, make sure the line is clear of obstructions and then, crouching forward, I whip that big fly back towards me as fast as I can. The fish are in such a frenzy that the fly is hit hard on the second strip, and shouts and screams erupt around me as I ram the hook home. 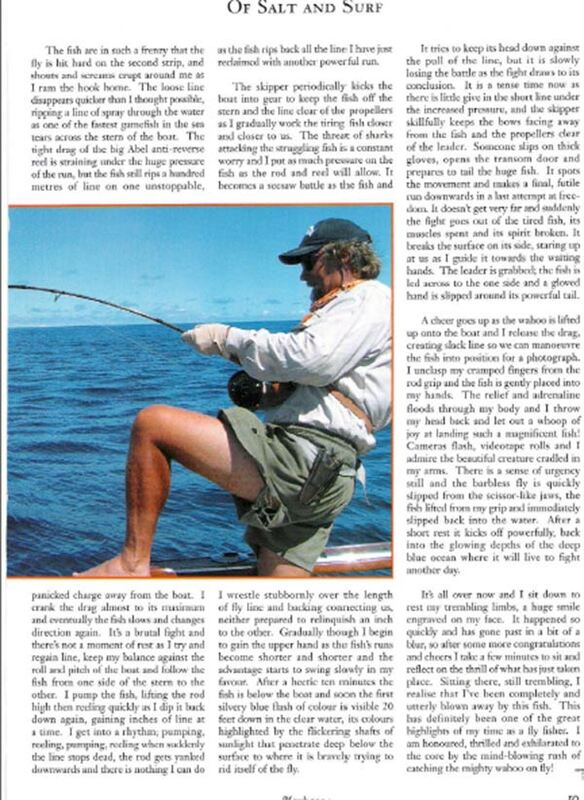 The loose line disappears faster than I thought possible, ripping a line of spray through the water as one of the fastest game fish in the sea tears across the stern of the boat. 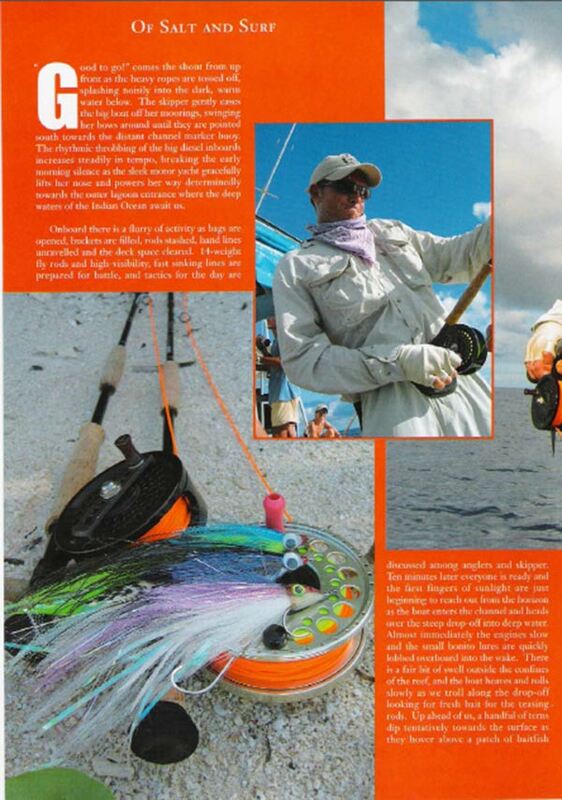 The tight drag of the big Abel anti-reverse reel is straining under the huge pressure of the run, but the fish still rips a hundred meters of line on one unstoppable, panicked charge away from the boat. I crank the drag almost to its maximum and eventually the fish slows and changes direction again. It's a brutal fight and there's not a moment of rest as I try and regain line, keep my balance against the roll and pitch of the boat and follow the fish from one side of the stern to the other. I pump the fish, lifting the rod high then reeling quickly as I dip it back down again, gaining inches of line at a time. I get into a rhythm, pumping, reeling, pumping, reeling when suddenly the line stops dead, the rod gets yanked downwards and there is nothing I can do as the fish rips back all the line I have just reclaimed with another powerful run. The skipper periodically kicks the boat into gear to keep the fish off the stern and the line clear of the propellers as I gradually work the tiring fish closer and closer to us. The threat of sharks attacking the struggling fish is a constant worry and I put as much pressure on the fish as the rod and reel will allow. It becomes a seesaw battle as the fish and I wrestle stubbornly over the length of fly line and backing connecting us, neither prepared to relinquish an inch to the other. Gradually though, I begin to gain the upper hand as the fish's runs become shorter and shorter and the advantage starts to swing slowly in my favour. After a hectic ten minutes the fish is below the boat and soon the first silvery blue flash of colour is visible 20ft down in the clear water, its colours highlighted by the flickering shafts of sunlight that penetrate deep below the surface to where it is gallantly trying to rid itself of the fly. It tries to keep its head down against the pull of the line, but it is slowly losing the battle as the fight draws to its conclusion. It is tense times now as there is little give in the short line under the increased pressure, and the skipper skilfully keeps the bows facing away from the fish and the propellers clear of the leader. Someone slips on the thick gloves and opens the transom door and prepares to tail the huge fish. It spots the movement and makes a last, futile run downwards in a last attempt at freedom. It doesn't get very far, and suddenly the fight goes out of the tired fish, its muscles spent and its spirit broken. It breaks the surface on its side, staring up at us as I guide it towards the waiting hands. The leader is grabbed; the fish is led across to the one side and a gloved hand is slipped around its powerful tail. A cheer goes up as the fish is lifted up onto the boat and I release the drag creating slack line so we can manoeuvre the fish into position for a photograph. I unclasp my cramped fingers from the rod grip and the fish is gently placed into my hands. The relief and adrenaline floods through my body and I throw my head back and let out a whoop of joy at landing such a magnificent fish. Cameras flash, videotape rolls and I admire the beautiful creature cradled in my arms. There is a sense of urgency still, and the barbless fly is quickly slipped from the scissor-like jaws, the fish lifted from my grip and immediately slipped back into the water. After a short rest it kicks off powerfully, back into the glowing depths of the deep blue ocean where it will live to fight another day. It's all over now and I sit down to rest my trembling limbs, a huge smile engraved on my face. It's all happened so quickly and has gone past in a bit of a blur, so after some more congratulations and cheers I take a few minutes out to sit and reflect on the thrill of what has just taken place. Sitting there, still trembling, I realise that and I have been completely and utterly blown away by this fish and that this has definitely been one of the great highlights of my time as a fly fisher. 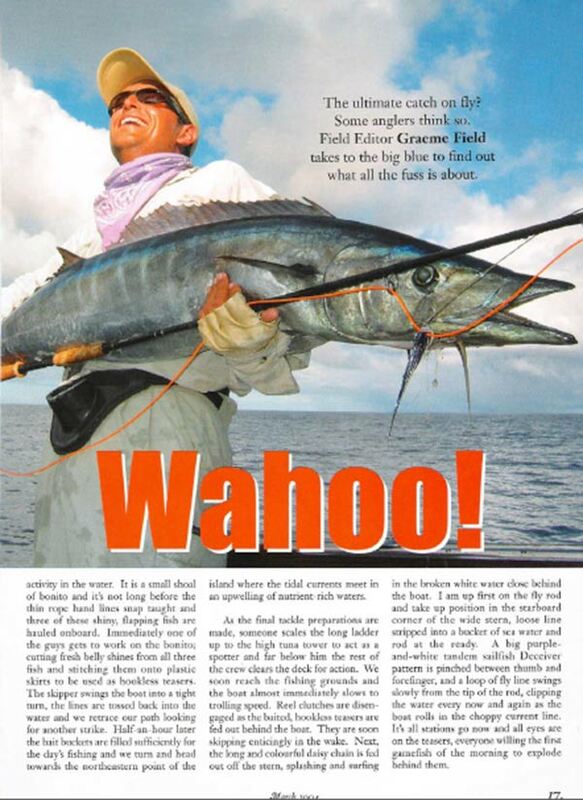 I feel honoured, thrilled and exhilarated to core by the mind-blowing rush of catching the mighty wahoo on fly.